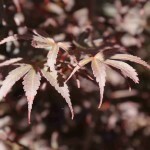 A small, upright tree or large shrub, discovered as a witches broom on Acer palmatum 'Bloodgood'. Bright red leaves in the spring mature to purple-red in the summer. The summer color holds well until fall, and then changes to scarlet red. It prefers well-drained, acidic soil. It originated in a nursery in Pennsylvania.